To make gum paste leaves on floral wire, you’ll need: 26 gauge (food safe) wire, green gum paste, rolling pin, angled offset spatula, CelBoard, gum glue, rose leaf cutter, dusting pouch, and a leaf veining mold or shaping foam and veining tool. CelBoards are nifty rolling boards that have grooves along one side and circular indentions on the other. 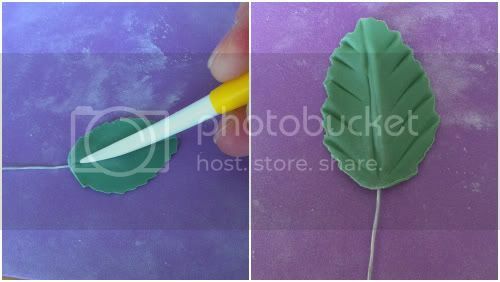 I’m not sure how I would make wired gum paste leaves without one, because they make such a handy ridge on the back of the leaf for threading the wire. Dust surfaces to keep gum paste from sticking. Roll gum paste into small log and position it over a groove in the CelBoard, then roll it out thinly. Carefully lift gum paste up and flip over. 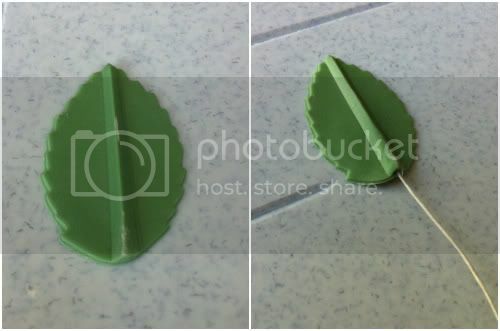 Position leaf cutter over gum paste so that the raised ridge is centered, and cut leaf shape. You can cut multiple leaf shapes and keep them covered so they don’t dry out before you’re ready to work with them. Gently thread wire into raised ridge on the leaf shape. This will be the leaf’s back. Thread wire carefully. When working with wire this thin it’s not always easy to keep it from poking out the front of the leaf as you thread it. You may or may not need to dip the wire in gum glue first. Vein leaf and then gently pinch the base so that it’s not loose around the wire. I have a silicone vein mold I really like because it textures both sides of the leaf at the same time, but a veining tool works too. Give the leaf some shape so it doesn’t dry flat.